"When I interviewed Morgan, she carried herself in a very professional and mature manner. That instantly grabbed my attention. She displayed confidence in her knowledge and skills and provided positive responses to my questions. She was enthusiastic when I described the job responsibilities and expressed her excitement for the position. Overall, she was the perfect fit. The knowledge she gained as a student at Point Park has given her the ability to be successful in the event (and business) industry." "There is a special relationship that students and professors get the opportunity to have at Point Park as opposed to going to larger schools and feeling like just another student in a large lecture hall. I can confidently say when I graduate from Point Park this spring that the faculty have made a difference in their students' lives even when they don’t always see it." How did you land a co-op position with Phipps Conservatory and Botanical Gardens? I met with Jessica Hobson, cooperative education specialist, in the fall semester of my senior year to update her that I wanted to pursue a career and co-op in the event planning industry rather than the real estate field. She sat down with me to look for companies that were hiring for positions within the event industry. She found the event assistant position at Phipps and suggested I send my resume to apply. Almost a week later I received a call from Phipps asking if I would like to come in for an in-person interview. My first interview was with Carolyn Winkelbauer, who works in the HR department. My second interview was with Katelyn Larsen (now my supervisor) and my final interview was over the phone with Carolyn Winkelbauer. Before the phone call of my final interview was over, Carolyn made me an offer to join the event team at Phipps and I ecstatically accepted! Tell us about the work you are doing for this co-op. Right now, I am doing a lot of hands-on learning. That includes learning what goes on behind the scenes in the office all the way to the event set up and tear down the day of the big event. During my office hours, I have learned how to update various databases the team uses and have sat in on meetings with current or potential clients who would like to host an event with Phipps. This can include engaged couples wanting to host a wedding, a local business or a charity looking to host a luncheon, married couples looking to renew vows or even professional photo shoots. The events team at Phipps does their best to accommodate everyone the best they can. On the days of the event, I have learned how to make sure everything is in place and ready to go. One thing I have learned while working within the event industry is if you see a need, then go fill that need. That phrase can even mean "putting out fires" (figuratively speaking) before they happen. What factors made you select Point Park University to study business management? I was late in the recruiting process for volleyball and I remember my mom pulling up Point Park University on the web and mentioning how it was in Pittsburgh, Pa. She heard about Point Park through a previous volleyball coach I had, and he told her that the volleyball coach at the time was recruiting for my position. My initial response was, “Yeah, okay mom, but no thanks. I think I’m going to commit to a smaller school in northern Indiana." However, she convinced me to just check out the school and we flew together to tour Point Park University and visit the city of Pittsburgh for the first time. I instantly knew this was where I needed to be and was going to spend the next four years of my life. They had a great volleyball program and being in the heart of Downtown I could already imagine the countless opportunities and connections the business program could offer. I didn’t really understand why God brought me to Pittsburgh, but after my four years here at Point Park and the doors that have opened, I finally understand why Point Park was where I was meant to be. How has our faculty impacted you? One thing I have really loved about studying at Point Park University is the class size. I love walking into a classroom where I recognize my fellow classmates and it is even more encouraging that my professors know my name. Not only do my professors know my name, but they take the time to get to know each and every one of their students. I love having the confidence in knowing that if I email my professor or need to reach out to them, they are always more than willing to step in and help me. I am also grateful that the professors offer recommendation letters for their students. There is a special relationship that students and professors get the opportunity to have at Point Park as opposed to going to larger schools and feeling like just another student in a large lecture hall. I can confidently say when I graduate from Point Park this spring that the faculty have made a difference in their students' lives even when they don’t always see it. 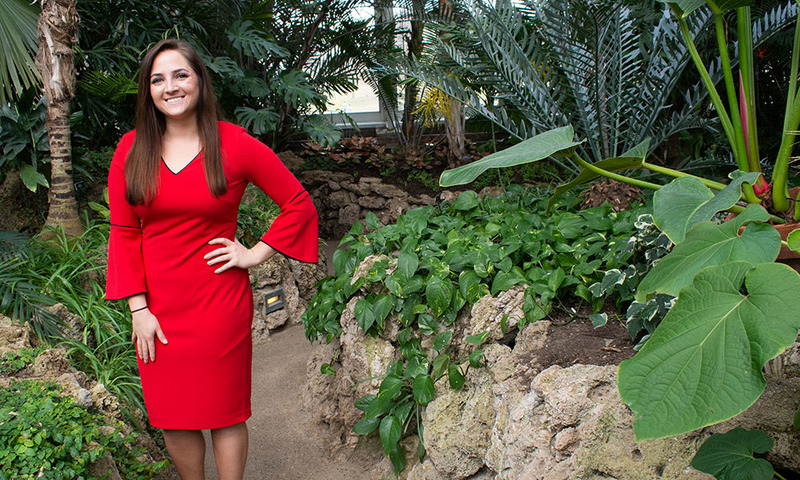 When I am in Pittsburgh, I want to spend as much time as I can working for Phipps because it has been such an incredible opportunity and experience so far. However, in the fall of 2019, I plan on moving to Charleston, S.C., and working for a company that specializes in wedding planning and private events. Maybe 10 years or so down the road I would like to build a venue along the coast and start my own wedding planning and private event company. I would also like to open my venue to other wedding planning businesses that have given me experience and taught me so much about the industry along the way.